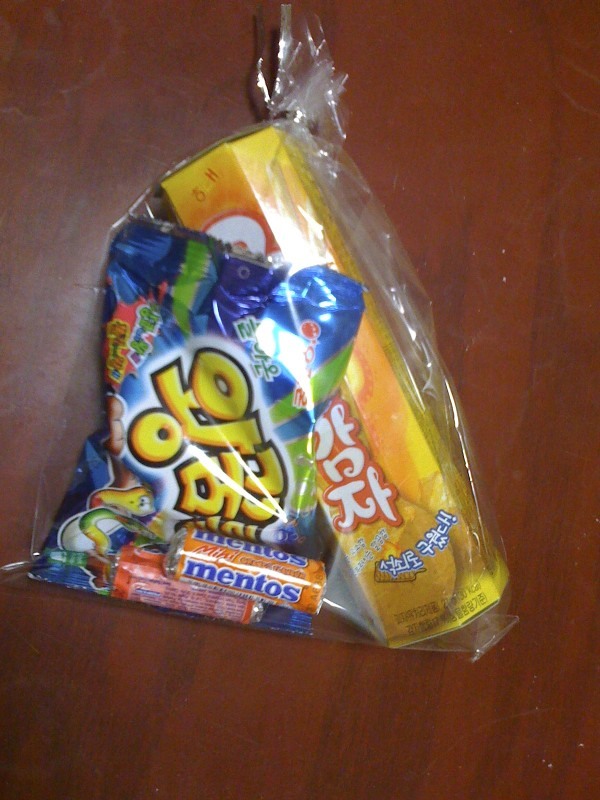 This was a gift from a student of mine, in my Memory Tera class – crackers, gummy worms and Mentos. It was nice of her to give it to me, but it has kind of a sad story attached, and it’s making me frustrated with the rest of the class. For reasons I can’t understand, everyone in my class hates her. Nobody will sit near her if I let them choose seats, and if someone accidentally sits near her, others will make fun of them for doing so. At first I thought it was just some of the students, the ones who made it obvious by saying mean things in English. But the harder I listened to the Korean, the more I realized everybody was in on it. I’ve put a stop to the outright hostility in class, but now they just try to ignore her. Today she decided to take the high road – her and her mom bought these snacks, and after the group project at the end of class she gave a pack to everyone. She seemed sad, but hopeful about the idea – I don’t know much about Korean kids society, but I hope it helps her. When she gave me this she said this has been a problem in all her classes here – other kids just hate her. Maybe there’s something lost in translation, but after having her six weeks she seems to be a perfectly average Korean girl. She’s a middle of the road student – not a slacker, not a bookworm. She spends most of her break times sitting alone, sometimes knitting – but so do a number of my other girls. She doesn’t seem to live and breathe the pop-music groups like the others – at least not so obviously – maybe that’s a black mark for her. It’s just so frustrating – she’s a nice girl, and I think she could get a lot more out of class if she wasn’t so lonely – 1/3 of every class is a big group project where the kids need to talk in English to each other to complete a task. I had most of the kids in this class before, and I liked them – I looked forward to having them again. But after seeing how they treat her I just want to drag them out by the collar every time I hear some snide remark or watch them rebuff her ideas in group projects. I thought she was really brave today facing such hostility head-on – she told me what she wanted to do before class, and I felt stressed for her the whole time. I just want to give her a hug and tell her to ignore the idiots – or time travel back to 5th grade and be her friend. I try to be friendly and talk with her at break, but I know it isn’t the same as your peers recognizing you. This entry was posted in Personal, Teaching and tagged stories. Bookmark the permalink.